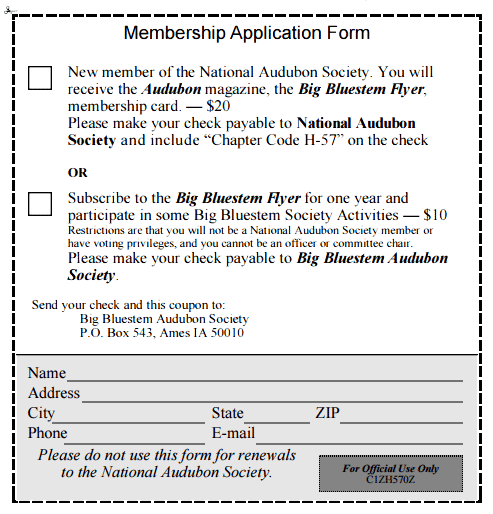 Any member of the National Audubon Society within the central Iowa area is a Big Bluestem Audubon Society member and should be receiving our newsletter, the Big Bluestem Flyer. We encourage Central Iowans to join National Audubon at which point you will also become a member of Big Bluestem. Simply print this page, complete the information, and mail with your check to the treasurer. © 2019 Big Bluestem Audubon Society. All rights reserved. Serving Ames and surrounding areas.